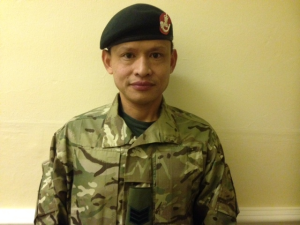 I am Sgt Sarad Thapa, ex 1 RGR, I left the regular army after 22 years of exemplary service and am currently serving with 7 Rifles, a Reserve Infantry battalion based in Reading, Berks. The battalion has 4 companies located in Reading, Abingdon, Oxfordshire, Davis Street in London and West Ham in East London with Platoon locations in Swindon and Aylesbury. There are a number of reasons why I joined the Army Reserve. First of all, it provides me the flexibility to choose the amount of days I want to work as a Reservist. Another reason for joining is the challenge that comes with the Tuesday evening training and on weekend exercises. 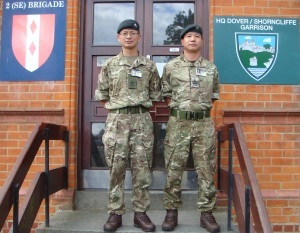 In many respects it is just like being in the Regular Army but the commitment is far less, this suits The culture of a reserve battalion is different from that of a Regular Gurkha battalion. In the reserves I get to broaden my social horizon and meet and socialise with people from all walks of life. Another appeal of being in the reserves is you get paid to go on Adventure Training, social events and trips such as battlefield tours – which broaden your experience. In addition there are the financial incentives for ex-regulars in joining the reserves, this equates to £10,000 over 4 years. Another financial incentive is the bounty, which can be up to £1,691 (tax free) per annum, provided you complete your MATT training and attend a two week annual camp. Ex-regulars are not obliged to be deployed overseas within the first three years of joining. Therefore, if your service with the regular army is coming to an end and you have not decided what line of civilian work to take up, or if you have work organised but still miss the excitement of serving – why not join the Army Reserves. I would recommend that you do so. Ex-Regulars who have left the Army within a period of one year are not required to complete any further medicals. Join the Army Reserves; it is exciting, fun and overall very rewarding. 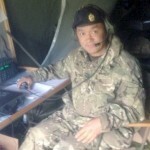 I am a retired WO2; WO2 Sherbahadur Gurung and currently in Army Reserves and working in the HQ 2 (SE) Bde as Ops/Youth Warrant Officer in Sir John Moore Barracks, Folkestone. Having completed my 22 years of regular service in the Brigade of Gurkhas, I have another golden opportunity to serve in the Army Reserve as a Youth Engagement Warrant Officer/Ops WO. There is always a bit of hectic or uncertain moment for all of us when retiring soon from a long Army career, when you have very little knowledge integrating into civilian life, especially like ourselves the retired Gukhas. I joined the Army Reserve few months after retiring from the regular army and continued to receive most of the Army benefits as well as contributing my 22 years of experiences for Army & Army Reserves along with my civilian job. I am feeling no different to being Regular Army as there are a wide range of benefits available I’m also and working in a similar environment. 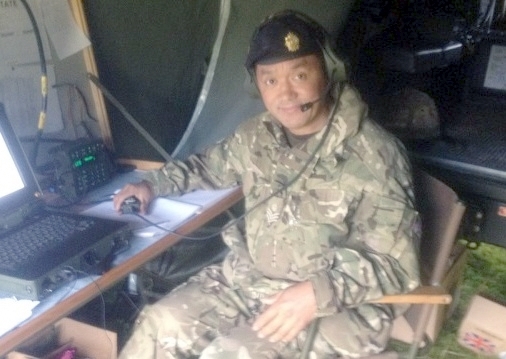 Initially; I had no idea or knowledge about the Army Reserve, however luckily I came to know Maj Kamal Rana SO2 OpsTrg G3/G7 (Ex 1RGR) who was working in the HQ 2 (SE) Bde and he helped and explained about the terms and conditions and the benefit of being in the Reserves with close direction which encouraged me to join. 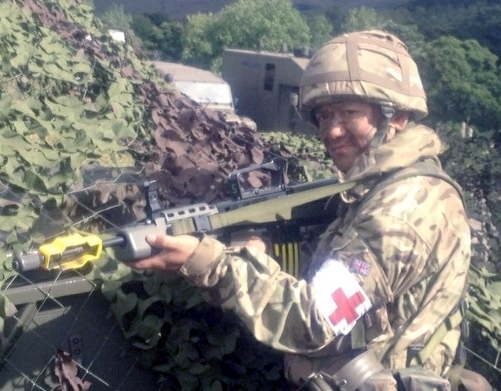 Having served for nearly a year in Reserves; I have experienced many new things which I never had those opportunities during my 22 years of regular service, ranging from community engagements, Adventure trainings, Battlefield studies, personal development courses, deployments and training exercises opportunities. Especially working in 1 Star level HQ which I’m very proud of, I have gained and learnt a lot of which many experiences are completely new to me, made friends sharing experiences both with reservist and regular Army. There are hundreds of roles available in the Reserves ranging from Pte, Drivers, Chefs, VMs, Signallers, Sect Comds, many more and all your skills can just be transparent and will also benefit your employer’s from the training you receive in the Reserves and you will have opportunity to make good career on your civil jobs to. This will be a perfect job for utilising your spare time. There are wide ranges of benefits available for both direct entrant and Ex-Regulars Army joining in the Army Reserves. There is a benefit called, Commitment bonus which is paid (Taxable) up to £ 10,000. The Ex-Regular (regular joining within 6 years of leaving the Regular Army) Junior Officer (Capt and bellow) are entitled for £10,000 over four payments within 4 years. This is an addition to pay at your former rank, allowance, and the tax free bounty (term and conditions apply). The Army reserve is getting Forces Railcards included for families and children under the age of 16 from this year and from 2015 Reserve Service will automatically accrue pension rights in the Army Pension scheme, redeemable after at least two years service and there are also opportunities for promotion. If you are employed in civilian jobs and want to join in the Army Reserve, the minimum commitment starts at 19 days and the normal is 27 days a year to commit on weekends but to earn your tax free bounty, you need to attend a minimum 27 Man Training Days (MTD) and requires attending MATTs depending on your formations (Level 1-3). If you are not employed or getting difficulties finding job out in the civilian market, this will even give you the opportunities for full time employment and there is no threat of in loosing your civilian job if you are mobilized as the MOD has agreed to make additional payments to your employers. There are some additional protections in the civilian workplace. If your job is terminated, and think that the main reason for it was something to do with you being a reservist, then you can appeal to an employment Tribunal even if you have only worked for your employer for a short time, currently you have to be employed for two years before you can do this. Finally, there are more opportunities available in the Army Reserve in hundreds of roles across the country and overseas. In my view, I fully encourage all retired soldiers and new generation youngster to join in the Army Reserve and take advantages and benefits of the Army Reserve in the mean time helping achieve to the Army 2020 structure to recruit 30000 by 2018. I am currently serving as a Mechanical Transport Senior Non Commissioned Officer with 254 Medical Regiment, based in Colchester. My full time civilian job is with First Buses which provides a bus service for the North East of England. I served for 18 years with QOGLR as a regular soldier before retiring as a Sgt in 2002. Since I have left the Army, I found that I was missing the camaraderie of service life and decided to join the Territorial Army (TA) in January 2010. I must admit that, it was hard work getting back to the necessary level of fitness required but I relished the challenge and managed to pass the fitness requirements without difficulty. Initially, I started with only low levels of training with some additional trade courses but now as Army Reservists we have a more demanding and exciting training programme linked with our regular counterparts. My unit has been particularly positive and loaded me onto different leadership courses during the very early stage of my Reserve career. This has developed my career portfolio which has allowed me to progress quickly up my career ladder leading to my recent promotion to SSgt in April 2012. My employer has also recognised the accredited leadership qualifications that I have gained during my Reserve Service; as a result I have achieved a supervisory position within my company a little earlier than others within my peer group. Reservist training covers a wide range of skills, much of which are nationally recognized, so it’s possible to integrate my new skills into my civilian employment. Some employers may have concerns releasing their manpower for extended periods, but the Government’s new financial incentives for employers will eradicate this issue. I like doing a job I know well and for which my whole Army career has given me the experience for. The money is good; I get paid almost the same per day as my regular service, get some allowances and can get a bounty of about £1500 if I attend the two weeks training camp. For anyone who is a Regular now wanting to join the Reserves you can get £5,000 if you sign up for 3 years. So it is easy money! And it is flexible – you can work round your other commitments and I get paid for annual leave. I am thoroughly enjoying both of my jobs and I am determined to develop both careers further. I feel that I joined the Army Reserve a bit too late to maximise my full potential within both careers, therefore, I would recommend to all Service Leavers to consider joining the Reserves at an early stage after their departure from Regular Service in order to take full advantage of the Army Reserve Service. If you want to know more about life in the Reserves see www.armyjobs.mod.uk or speak to your RCMO.